Isolate your glutes, quads and calves for faster results with the unique Power Intensity� Ramp on the HealthRider� H90e Elliptical. Adjusting the incline of your stride forces you to use your entire muscle. Target your glutes with a 10% incline, your quads at 20% and your calves at 30%. The H90e is designed for stability and proper foot placement. The oversized pedals have built-in cushioning for ultimate comfort. And, with iFit� Workout Card Technology, you�ll be losing weight and feeling great! This 8-week program plugs directly into the elliptical�s console and automatically adjusts your resistance for maximum results. Plus, the H90e is also equipped with 24 built-in workouts, a Compatible Music Port for iPod� and the convenient One-Touch� Resistance. The Power Intensity Ramp� allows you to adjust the incline of your elliptical stride�forcing you to use your muscles differently. This lets you fully develop your entire muscle, not just part of it. Target your glutes with a 10% incline, your quads at 20% and your calves at 30%. Move to the beat of your favorite music with this built-in sound system. Plug your iPod�*, or MP3 Player, into the Interplay� Music Port for unbeatable sound quality. With the iPod� resting on the console shelf, it�s within easy reach and leaves the controls right at your fingertips. 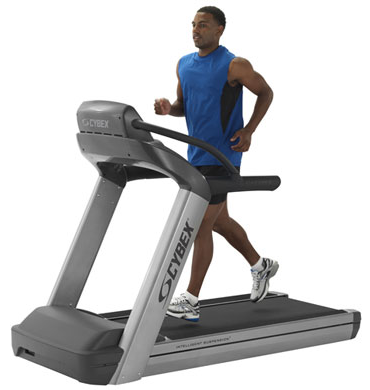 Enjoy long, full strides and develop long lean muscle with this generous 18� stride length. Fitness is about getting in shape, not getting in your way. This innovative elliptical�s pedals and base quickly and easily fold-up to save you nearly 3 feet of precious floor space. Burn fat, lose calories and stay motivated with Personal Trainer Workouts. These programs take the guesswork out of your workout by automatically adjusting the resistance of the elliptical for increased intensity. Choose between competition, weight-loss or aerobic workouts and you�ll be on your way to success. The length and resistance level of each workout is pre-determined so the only thing you have to worry about is pressing start. Heart Rate Workouts help you stay in your target heart rate zone�increasing the resistance when you need to raise your heart rate and decreasing the resistance when you need to lower your heart rate. Customize your own workout with these easy-to-use Create & Save� Workouts. You pick your goal, resistance and time length for the ultimate, personalized workout. To increase intensity and get faster results, simply adjust your resistance at any time during your workout with the touch of a single button instead of having to scroll through options. 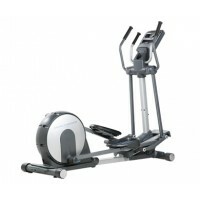 Able to withstand the most rigorous workouts, this heavy-duty elliptical has a tough commercial-gauge steel frame. This smooth, frictionless resistance system allows you to adjust your workout intensity without interrupting your workout. Choose from 15 resistance levels to target specific workout and conditioning goals. Take your training from typical to inspirational. This attractive display can either show multiple information fields for more at-a-glance information, or show a single display for on-the-fly goal training. Track your speed, time, distance, calories burned and pulse. Stay cool and fresh during your workout with the innovative CoolAire� Workout Fan. You'll stay comfortable, enabling you to workout longer so you can reach your goals faster. The sophisticated fan is built right into the console, just like the AC in your car, allowing you to quickly adjust the settings and find the perfect temperature. Designed for stability and proper foot placement, these oversized pedals have built-in cushioning for ultimate comfort. 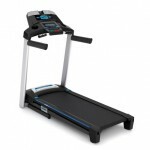 This elliptical accommodates up to 325 lbs. 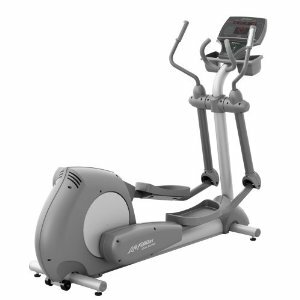 The HealthRider� H90e Elliptical comes with a Lifetime Frame Warranty and 1-Year Parts & Labor.